A new view of Hurricane Irene from a satellite orbiting Earth shows the powerful storm just after it made landfall on the U.S. East Coast today (Aug. 27). The new hurricane photo, taken by NOAA's GOES 13 weather satellite 22,300 miles (nearly 36,000 km) above Earth, shows Irene as it appeared at 10:10 a.m. EDT (1410 GMT). Irene made landfall in Cape Lookout, N.C., today at about 8 a.m. EDT (1200 GMT) as a Category 1 storm, with maximum sustained winds of about 85 mph (136 kph). The storm has been lashing the U.S. Eastern Seaboard and at least two deaths directly caused by the hurricane have been reported, according to news reports. "The storm surge and rough waves it brought have been severely battering the coast," Gutro explained. "At that time, the first rainfall from Irene's outer bands reached the Washington, D.C. area bringing brief moderate to heavy rainfall," Gutro wrote. When the first rains fell on Washington, the center of Irene was about 50 miles (80 km) west of Cape Hatteras, N.C. — about 328 miles (527 km) southeast of Washington, he added. NASA satellites have watched Hurricane Irene swell in size over the last week, with the storm's diameter growing from 200 miles (321 km) across to a whopping 600 miles (965 km). By mid-day today, Irene's influence had dipped to about 520 miles (836 km), with tropical-storm-force winds prevalent along its outer rim while hurricane strength winds extend up to 180 miles (289 km) from the hurricane's center. Current forecasts predict that Irene will bring up to 10 inches of accumulated rainfall, with some isolated regions seeing up to 15 inches, between eastern North Carolina to the mid-Atlantic states, eastern New York and the New England interior. "Irene is now forecast by the National Hurricane Center to take a more inland track and maintain hurricane force near coastal New York, western Connecticut and western and central Massachusetts," Gutro wrote. 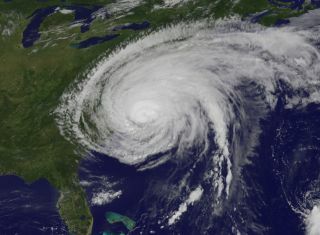 Several NASA space and research centers in Virginia, Washington and New York City are on alert for Hurricane Irene. A storm surge of about 2 feet is expected at the space agency's rocket launch facility on Wallops Island, Va.
Astronauts in space have also been tracking the progress of Hurricane Irene. The six-man crew of the International Space Station has been snapping photos of Irene daily, with NASA astronaut Ron Garan posting photos on Twitter, where he writes as @Astro_Ron. "#NYC#Boston + #Cape #Fromspace in 'Calm before the Storm' as #Irene visibly looms offshore," Garan wrote in his post. "Plz be prepared."